and texting future with ShotPut Pro? Don’t worry! There’s a simple and free resolution and we are here to tell you all about it. First, let’s cover what it means exactly. 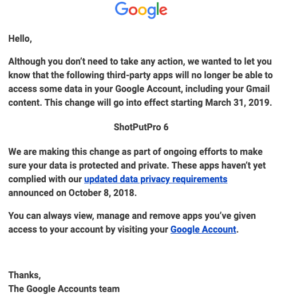 Google is making some changes to its privacy features with a new API, which is not in ShotPut Pro 6. 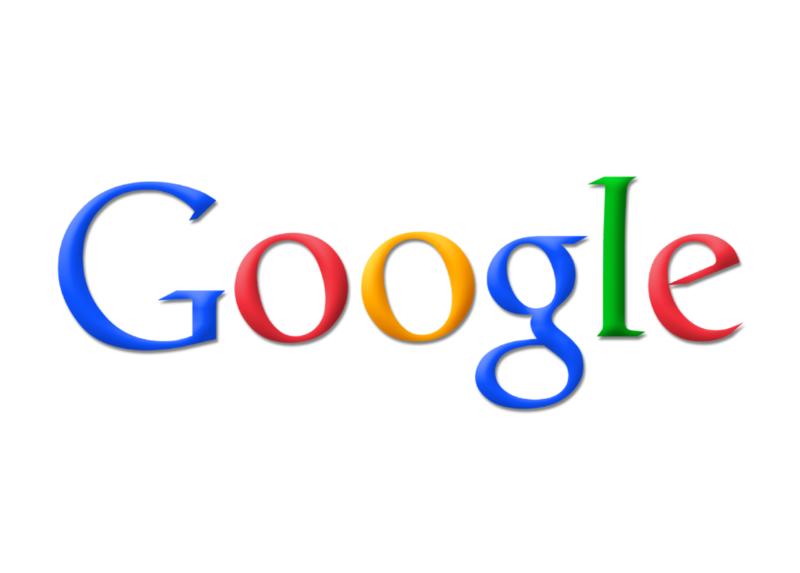 Wait, what the heck is an API? An API is “a set of functions and procedures allowing the creation of applications that access the features or data of an operating system, application, or other service.” (Thanks dictionary.com) Basically it’s the rules and functions that ShotPut Pro has to use to talk to your gmail account. So, how do you resolve this? Easy. Update to ShotPut Pro 2018. It’s free and simple to do. You can either “check for updates” from the ShotPut Pro menu in the upper left-hand corner in the app or download the new version from your licenses page. Here’s a handy-dandy FAQ on how to do that. It’s that simple! From there you will be back up and running with your preferred notifications. Does ShotPut Pro 2019 have these new rules built in for the notification as well? Of course! And so much more…. If you’d like to learn more about the new features of ShotPut Pro 2019 read on. If you are ready to update to ShotPut Pro 2019 you will need a current update plan, you can learn how to do that here. ShotPut Pro 2019 boasts a new simple mode as well as the classic preset mode you know and love in ShotPut Pro. The simple mode allows faster offloading in a quick and… wait for it…. SIMPLE way. Add files or folders to an already existing location without creating a new folder. You’ll still have the benefit of checksums and reports like you do in the traditional preset mode. And speaking of reports, we’ve added MHL reporting in this version as well! The MHL reports adhere to the standard naming conventions. There’s also a ‘separate file of checksums’ option which uses formatted text to list file names and their checksum values. We also improved the PDF reporting while we were in there! More metadata and now you can choose between designated the first frame for the PDF thumb or sticking to the percentage sampling. Thumbs for the new Codex .ARX RAW frames have also been added. If you still have questions about ShotPut Pro 2019, check out this blog. If you want to learn more about the update plans, visit or FAQ page here.